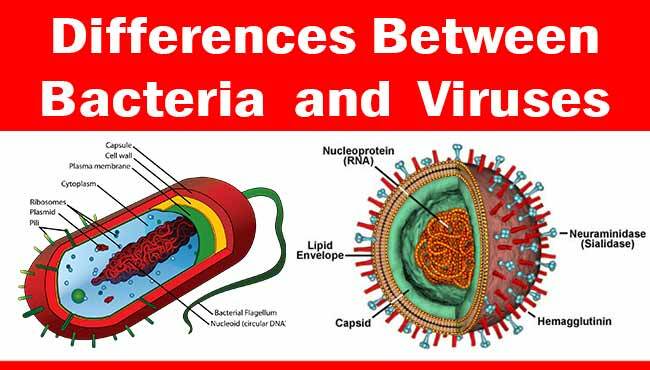 Although bacteria and viruses both are very small to be seen without a microscope, there are many differences between Bacteria and Viruses. 2 Cell Wall Peptidoglycan or Lipopolysaccharide No cell wall. Protein coat present instead. 5 Living/Non-Living Living organisms Between living and non-living things. 6 DNA and RNA DNA and RNA floating freely in cytoplasm. DNA or RNA enclosed inside a coat of protein. 9 Reproduction Fission- a form of asexual reproduction Invades a host cell and takes over the cell causing it to make copies of the viral DNA/RNA. Destroys the host cell releasing new viruses. 10 Duration of illness A bacterial illness commonly will last longer than 10 days. Most viral illnesses last 2 to 10 days. 11 Fever A bacterial illness notoriously causes a fever. A viral infection may or may not cause a fever. 13 Under Microscope Visible under Light Microscope. Visible only under Electron Microscope. 14 Benefits Some bacteria are beneficial (Normal Flora) Viruses are not beneficial. However, a particular virus may be able to destroy brain tumors. Viruses can be useful in genetic engineering. 15 Treatment Antibiotics Virus does not respond to antibiotics. More about symptoms–chills and clamminess for instance. (trying to tell what I have and how long before I should take antibiotics. No 12 answers that. Viruses do not possess cellular machineries. They live in protein coats. Simply put, they do not require cells to exist.